I hope you are all enjoying your Labor Day weekend. Down here I've taken the holiday literally. My entire Saturday was filled with work, though don't get me wrong, it was work of the delicious persuasion. My friend and I got up early-ish (I mean it IS the weekend after all) and visited three different Farmer's Markets, ferreting out peaches. My original plan was to drive to a farm and pick our own like I did last year, but then I did the math and between the gas and the three or four hours that such a trip would take, staying close to home and going to the market was sounding better and better. The rest of the day was spent happily in my friend's large kitchen. 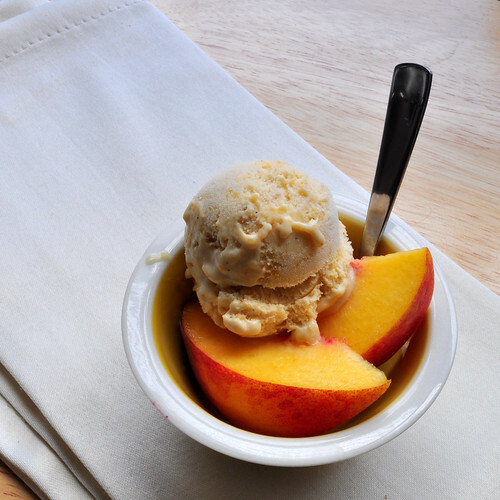 I made two batches of peach ice cream, roasting peaches with a touch of sugar and raspberry balsamic for one and simmering down some peaches with honey and lemon juice for the other. I made eight batches of roasted tomato sauce base under the strict supervision of my friend, whose recipe this was, roasting tray after tray of quartered plum tomatoes, onions and garlic slathered with a bit of olive oil, salt and pepper. I made a batch of gorgeous peach butter and another batch of golden gingered peach jam (recipes coming soon). At the end of the day I was tired, sore, and sweaty despite the AC that occasionally dripped on my head as I stopped under the vent to wash the dishes, but the house smelled amazing, everything was canned or bagged or frozen, and as I sank into the deep cushy sofa in my friend's back room I felt a deep sense of satisfaction (and my aching back...oof). And so I rewarded myself with a scoop of ice cream. Heat the heavy cream, milk, vanilla bean and sugar in a medium sauce pan over medium-low heat until it's just below simmering, then turn off the heat. Let this mixture sit and steep. The longer you wait, the stronger the vanilla flavor will be. Bring the mixture back to a low simmer once you're ready to continue. Whisk together the yolks in a medium sized bowl. Pour a cup of the hot cream mixture into the eggs, whisking rapidly the entire time, essentially tempering the eggs so that they don't turn into an omelet in the next step. Whisk another cup of hot cream into the eggs and once everything is warm, whisk the eggs into the pot of remaining cream. Gently whisk the custard over low heat until the mixture starts to thicken. When the custard seems to be getting thicker, dip a spoon or a spatula into the mix and run your finger through it. It is done when the custard clings to the flat surface. Strain the custard through a mesh strainer into a shallow dish. Cover the dish with plastic wrap, making sure that the wrap rests directly on the surface of the custard to prevent a skin from forming, let it cool a bit on the counter and then place in the fridge. Allow the custard to chill and thicken overnight or until it's thoroughly cold. Combine peaches, honey and lemon juice in a large pot and cook on high, stirring regularly, for 20 minutes or until the peaches are so soft that they're starting to puree themselves. Remove from heat, puree, pour into a shallow dish, cover with saran wrap just like the custard and chill. 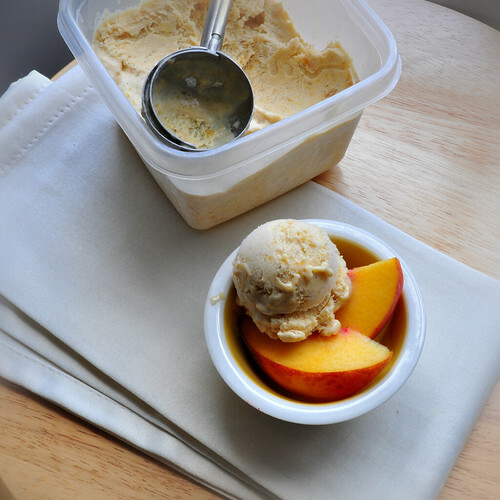 Once you're ready to churn the ice cream, stir the peach puree into the custard and process the yummy goodness in your ice cream maker according to manufacturers instructions. This ice cream looks really yummy *O*! Impressive haul! And I love the feeling of satisfaction after doing so much hard work in the kitchen. 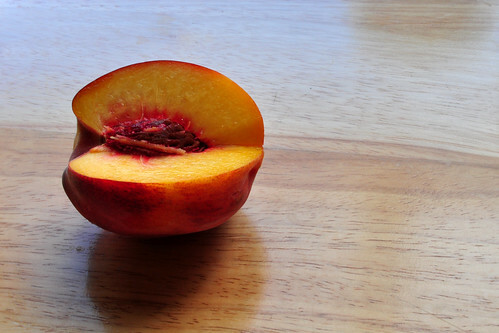 I haven't done much putting-up with peaches, but my grandmother used to always can them. They were so very good.... especially in the dark days of winter. You'll be so lucky in a few months to have a bit of sunshine in those jars and packages! Man, I totally forgot to taste it.